What is the Accredited Residential Manager Designation? Do you run a mobile home park? Or manage a community of townhouses? Maybe an apartment building? In contrast to designations offered by CAI and NAA, the ARM designation is less property specific and more skill set specific. As a result, it is widely recognized in the residential property management industry. While most property manager’s know IREM for commercial properties, they actually run the ARM program. It is on of their property management credential for residential property managers. The ARM designation has similar requirements to other IREM certified property manager credentials. This includes minimum portfolio sizes, years of experience, and industry knowledge. Another benefit of the ARM designation is versatility. It is not specific to just HOA’s, apartments, or single family homes. For that reason, it can help residential property managers access a wider range of jobs. Finally, may ARM education courses count towards earning the CPM designation. As a result, the ARM education courses are a solid first step towards earning the CPM designation. 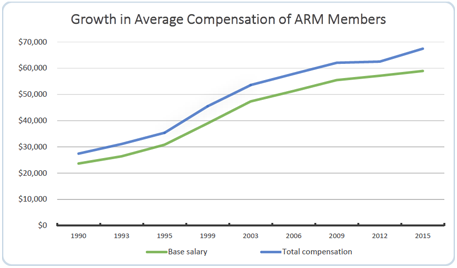 Compared to the average property manager salary, ARM’s and CPM’s earn significantly more over their careers. For more information becoming an Accredited Residential Manager, contact the Institute of Real Estate Management.